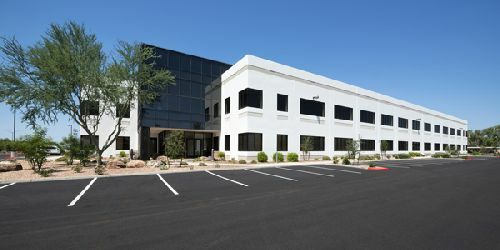 Minnesota-based Founders Properties LLC paid $10.06 mil for a two-story, 63.8k sf ($158/sf) Class A office building located within Inverness Commons Business Park, in the hub of Mesa, AZ’s booming Higley Road medical corridor. The building is 92% leased to a broad base of tenants. The building is located at 5416 E. Baseline Rd, just east of Higley Rd and immediately south of the US 60 Fwy. A recent $2.3 mil building renovation improved the property with new lobbies, upgrades to hallways and tenant spaces, new landscaping and a new parking lot offering a parking ratio of 5.86/1,000. Building tenants have an average lease term of over five years. Acumen Fiscal Agent LLC and Ring Inc, owned by a Fortune 10 company, are the project anchors. Other tenants include Sharecare Health Data Services LLC, Fairway Independent Mortgage Corporation, Confident Financial Solutions and Cardiovascular Associates of Mesa. The 5416 building sits within a major medical node and employment hub that includes Banner Gateway Hospital, Banner MD Anderson Cancer Center, Davita/Southwest Kidney Dialysis and the Arizona Health and Technology Park. Other new area developments include Fry’s Marketplace, Hilton Garden Inn and Conference Center, Savanna House senior living center and The Highland Retail Plaza, which includes a recently delivered Starbucks, Popeyes, Rudy’s Bar-B-Q, Circle K and Del Taco. Brian Ackerman with JLL represented the seller, James Greaves with G2 Capital, in the transaction. JLL Managing Directors Mark Gustin, Karsten Peterson and Dave Seeger are the building’s exclusive leasing brokers. Two vacant suites are available within the building, totaling 2.2k sf and 2k sf. Both have been newly renovated and are move-in ready.